I’d seen Head, Hands and Feet on the Old Grey Whistle Test, playing Warming Up The Band and was pretty impressed so I decided to go and see them at Newcastle City Hall. For this gig the seats were unreserved; you paid your 60p at the door and could sit whereever you wished. Support came from Patto, who I hadn’t heard of before going to the gig. Patto were formed out of the 60s band Timebox, who did a great version of The Four Seasons song Beggin’ which I can remember being a dancefloor favourite at our local Top Rank in the late 60s. Patto were just great, with Mike Patto on vocals, John Halsey on drums, Ollie Halsall on guitar, and Clive Griffiths on bass. Mike Patto and Ollie Halsall have both now sadly passed away. They were both incredible musicians, Patto with a raucous soulful voice and Ollie with a very fast, fluid and jazzy guitar style. Patto live were just great. 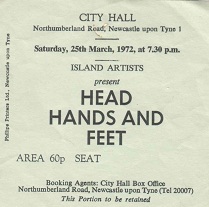 Head, Hands and Feet also featured a top guitarist in Albert Lee, and Chas Hodges (later of Chas and Dave) on bass. The rest of the six piece were Tony Colton on lead vocals, Ray Smith on rhythm guitar, Pete Gavin on drums, and Mike O’Neill on keyboards. Head, Hands and Feet were quite American (although they were from the UK) and country rock in style. I sat totally in awe of Albert Lee, particularly when they played Country Boy, which featured much country twang soloing from Albert. I remember this as a gig with two great bands, neither of whom went on to achieve the success that they should have. And come to think of it I don’t have lps by either of these bands, which is something that I really need to correct. I’m off to ebay to have a look for a Patto or a Head, Hands and Feet lp!